A major part of this task involves IOM undertaking a survey of UK companies and organisations that are involved in the production, use, research & development (R&D), and disposal of products containing manufactured nanomaterials (MNMs). The information collected will enable us to better understand how MNMs are used in the UK and assist in identifying gaps in knowledge about exposure and how this can be effectively controlled. We will develop an authoritative inventory of exposure scenarios encountered by the UK MNM industry. Exposure Scenarios are the set of conditions that describe how a substance is manufactured or used during its life-cycle and under which risks associated with identified use(s) of a substance can be controlled. They play a critical role within REACH, both as a tool to carry out an iterative risk assessment and as a tool for providing information for users down the supply chain. Information provided in the scenarios includes operational conditions, risk management measures and the estimated exposure. Manufactured Nanomaterials (MNMs) are materials containing at least one dimension on the nanoscale (i.e. between approximately 1 nm and 100 nm) or with an internal or surface structure at the nanoscale. Only manufactured nanomaterials are being considered in this survey, i.e. materials purposefully produced to be nanomaterials. Products or articles containing nanomaterials or nanotechnology-based products are also covered by the survey. Unintentionally produced nanomaterials (i.e. by-products of a process such as fumes, diesel exhaust, particles generated during grinding and friction of bulk materials, etc) and naturally occurring nanoparticles (e.g. volcanic ash, ocean spray, fine sand), are outside the scope of the survey. Thank you for your interest, Our on-line survey is now completed and has been closed. 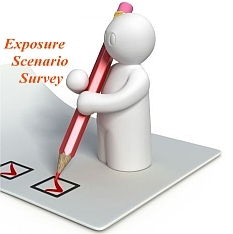 Exposure Scenario Survey Report: The results of the Exposure Scenario Survey have now been reported by the research team. The report is available from this site in this downloadable PFD file (2 MB). How can I help with the project? We are asking organisations that manufacture and/or use MNMs, or products containing MNMs, in the UK, to provide some brief information on the materials handled, activities undertaken and quantities used. This is done by completing a short, confidential questionnaire, which should take no more than 10 minutes to complete. At the end of the questionnaire, organisations may opt-in to participate in a later follow-up study, which will examine information about nanomaterial exposure scenarios important to the UK MNM industry in greater detail. There are no direct individual benefits to you or your company or organisation for taking part in this research. However, the survey will provide important information about current and nanomaterial use, as well as potential exposure, and will help to ensure that the NANoREG project is appropriately targeted and focussed on real world nanomaterial exposure. There are no risks to you by participating in in the research. Will my participation in the study be confidential? The information we gather will be used to develop a summary inventory of exposure scenarios relevant to manufactured nanomaterials in the UK. The data collected will be anonymised, aggregated and summarised in a short report that will be made publicly available. No companies, organisations or individuals will be identified and all information we collect from you will be treated confidentially in accordance with the UK Data Protection Act, 1998. What will happen to the information collected? The information we collect will be anonymised, aggregated and summarised in a short report that will be made publicly available. Updates on the overall project will also be available from this website. The Exposure Scenario Survey Report is now available. Copyright IOM © 2014. All Rights Reserved.